Cinemagoers Enjoy Travel to "Shutter Island"
Their creepy crime thriller set at a remote insane asylum opened with $41.1 million. "Shutter Island" is the fourth collaboration for Scorsese and DiCaprio and the best opening yet for both the director and star. Scorsese's previous personal best was $26.9 million with his 2006 Academy Awards champ "The Departed," which also starred DiCaprio. 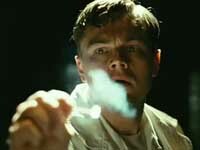 The biggest previous debut for DiCaprio was $30.1 million for 2002's "Catch Me If You Can." The previous weekend's top movie, the all-star romance "Valentine's Day," slipped to No. 2 with $16.6 million, falling a steep 70 percent from its $56.3 million debut. The Warner Bros. release raised its total to $86.9 million after 10 days in theaters. The science-fiction sensation "Avatar" is still going strong after two months in theaters, coming in third with $16.2 million and raising its record domestic total to $687.9 million. Worldwide, the 20th Century Fox film has taken in almost $2.5 billion. Macomb Daily has contributed to the report.